The resulting script was a piece of sci-fi set in outer space, with a twist in the tale at the very end. Before I wrote it, a short story by Arthur C. Clarke came immediately to mind, a clever little 1953 vignette called Encounter at Dawn. What I’ve always remembered about this particular story is the power of its closing line – in the space of just a few words, Clarke manages to turn his entire premise on its own head. Not an easy thing to achieve, but it’s a poignant and satisfying effect if you can pull it off… and that’s the effect I was going for with my submission, which I called “Generations”. FutureQuake accepted the story and teamed me up with a suitable artist – a big relief on my end, as it’s often pretty tough to find a good artist all on your own. 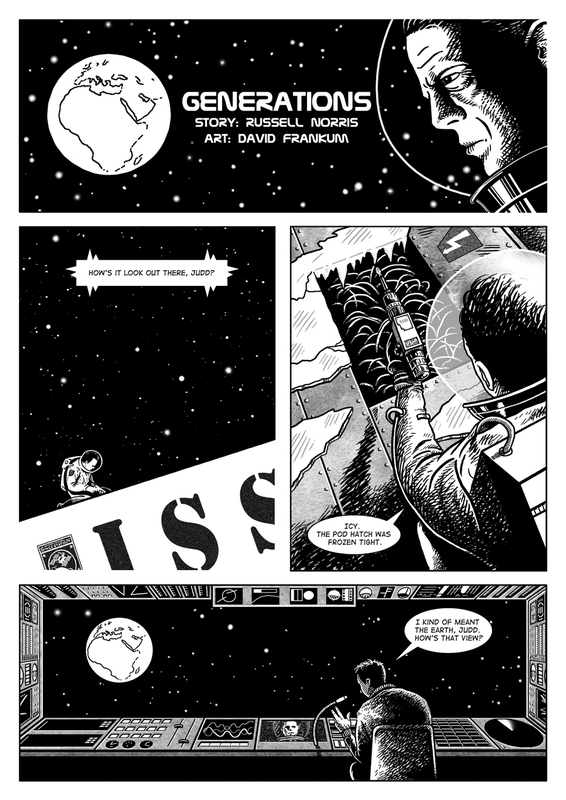 I was paired with the talented illustrator David Frankum who, over the course of a month and several dozen emails, helped me to turn my script into a fully realised black-and-white comic. 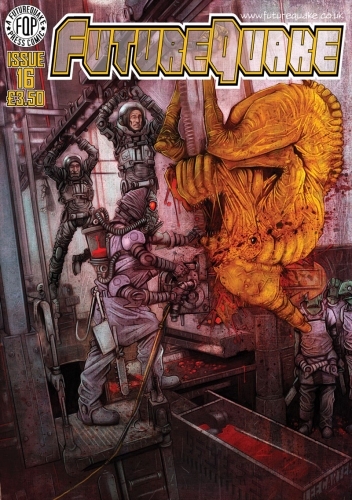 The story was published in the autumn, with nine other short comic strips, in FutureQuake #16. 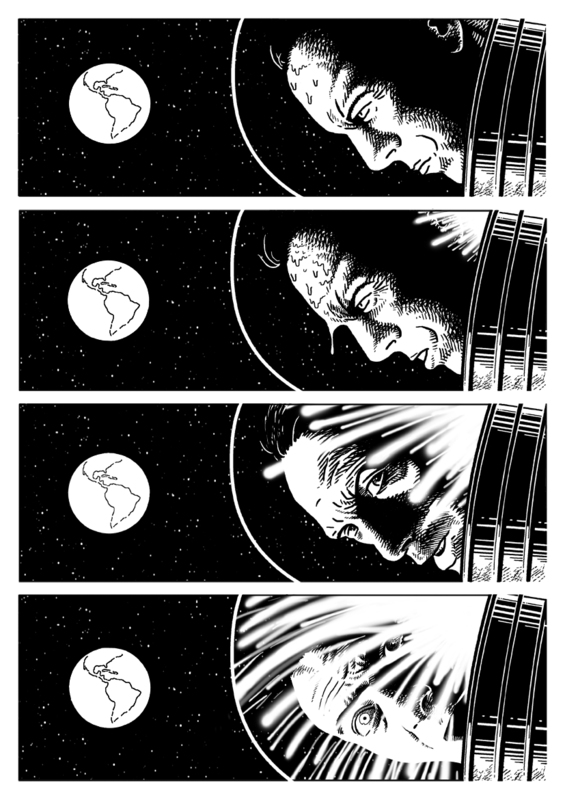 I’ve posted two sample pages of the final artwork below. If you’d like to read the full thing, you can buy a copy of the magazine in the FutureQuake Shop for £3.50. Sorry, I’ve got to support the magazine and encourage their sales! As ever, your comments are 100% welcome. 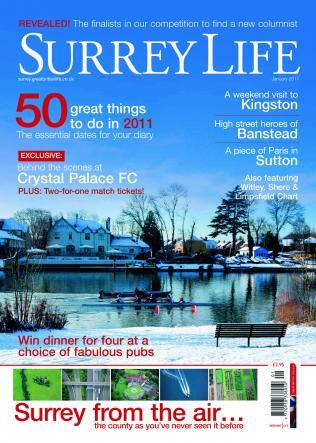 Last winter, I spotted a competition in the pages of Surrey Life magazine. They were looking for a new freelance writer to join their editorial team and contribute a monthly column. The challenge was to come up with a running theme based on life in Surrey and to submit a 500-word article for their consideration. As a Surrey resident (I grew up in Sutton and now live in Surbiton), I felt I had a few things to say about the county. So I sat down and came up with the concept that “There’s Something About Surrey” i.e. every month I’d tell readers something that they might not know about their leafy corner of England. I wrote a sample article about H.G. Wells (one of Surrey’s claims to fame) and sent it off to the editor. To my surprise, about a month later, I found out that I’d made the final shortlist. I was one of six writers up for the main prize: a column in a glossy culture magazine to call their very own. The only hitch? The winner was now going to be decided by the public. I had to write a small intro to my piece and send in a mugshot. Then, in the January 2011 issue of Surrey Life, my article was published along with five others… and readers were asked to vote for their favourite candidate. I based this initial column on H.G. Wells because he represents perfectly the theme I’d like to stick with if Surrey Life readers pick me as their winner – the idea that “there’s something about Surrey”. Our county is a treasure trove of famous people and quirky facts, all of which we should be proud of but many of which we don’t even know about. For example, did you know that the very first game of cricket was played in Guildford? Or that the opening scenes of Gladiator were shot in Farnham? Did you know that old-school legends like Laurence Olivier and new-school jokers like David Walliams were born and raised here? Surrey is stuffed to the gills with local titbits that will put a smile on your face and, if given the chance, I’d love to start sharing some of them with you. When my parents first moved to Sutton in 1985, they seriously considered buying a small Edwardian house that once belonged to H.G. Wells. They chose a larger home a few blocks away, in the end, but when I later realised that I’d almost shared a roof with someone my teacher called “The Father of Science Fiction”, I started getting curious about the man and his work. In my early teens, after years of walking to school past that squat redbrick house that I so nearly grew up in, I picked up and raced through a copy of The Island of Doctor Moreau. It was my very first Wells novel and it’s still one of my favourites: I like to think that he wrote that dark tale of savage beast-men marooned in the South Pacific as he sat snugly in South Sutton, sipping tea. Like many of our popular sci-fi writers (C.S. Lewis, John Wyndham, Terry Pratchett), H.G. 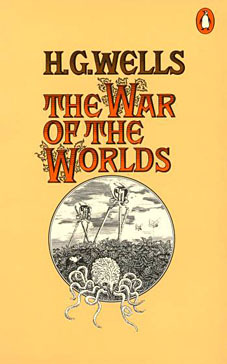 Wells had a real knack for making otherworldliness seem oh-so-very English. More often than not, his futuristic visions became oh-so-very Surrey. The hero of The Time Machine, for instance, is described as an intrepid inventor from Richmond – and the very first story of global alien invasion, The War of the Worlds­, was written in Woking and is peppered with local references. In that novel, when strange explosions start erupting on faraway Mars, it’s a small observatory in Ottershaw that spots and reports them. When Martian meteors begin hurtling down to Earth, they crash-land first and foremost into the soggy sand pits of Horsell Common. Terrified suburbanites turn and flee from Woking in the direction of Leatherhead, but before long, Martian warlords are bounding after them across the Surrey countryside in giant mechanical tripods. Armed with deadly Heat-Rays, the ruthless invaders attack Byfleet, Weybridge and Shepperton before bringing the River Thames to boiling point as thousands try to escape across it into Essex. Living in the county that inspired such famous literary scenes is a real bonus, in my eyes. We, in Surrey, can walk across the town square in Woking and gaze up at a life-size sculpture of a Martian tripod. We can visit the H. G. Wells pub in Worcester Park, which provided the setting for his short story The Argonauts of the Air. We can even amble down a residential road and have a sudden, unexpected brush with greatness: “H.G. Wells, 1866-1946, Once Lived Here”. But, to top all of this: when we escape into some of the most cherished science fiction stories ever written, we can also say that we’re taking a short stroll into our own back yard. In a time when alien attackers only ever have eyes for Los Angeles and New York, I ask the unassuming people of Surrey – how cool is that?